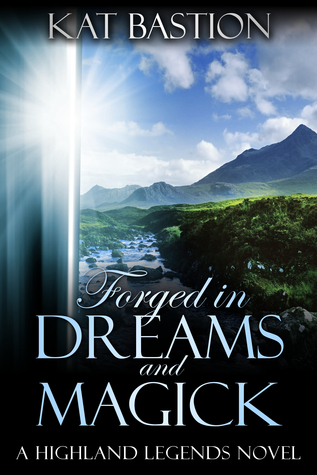 Thanks to AToMR Tours, we're pleased to present a review for the brand new time travel/paranormal romance, Forged in Dreams and Magick, by Kat Bastion. Keep scrolling to check out our review and then enter to win a copy for yourself! Make sure to check out the other stops on the tour for more. If you're looking for a romance story that spans history, look no further. Isobel is reeling from the loss of her beloved grandfather when she discovers a mysterious, ancient box that piques the curiosity of her academic side. She gets more than she bargained for, however, when she finds herself repeatedly being transported through time, drawn towards men who are supposed to be her soul mates. Isobel is a fun, sassy main character, and I enjoyed getting to read about her transformation as she adapted to the different eras that she found herself living in. She never allowed herself to wallow too much over things, no matter how upset or confused she was by her involuntary time traveling. Instead, she made the best of the situation, and made herself right at home, adapting to the ways of the times she found herself in, but never exactly losing herself. There are different expectations of women in these eras, but Isobel makes it pretty clear to Iain and Velloc that she's not about to let them control her. She learns to fight and take care of herself, and is able to work out several compromises that keep everyone happy. And of course, Isobel's romances are epic! Paired up with two strapping, alpha-type men, she still manages to hold her own against them. I don't think either Iain or Velloc had any idea what they were getting into whenever they first met Isobel! I liked watching Isobel open herself up to the possibility of romance, which she had been pretty dead-set against at the start of the book. And both of the men truly, tenderly care for her, and aren't using her or (really) trying to deceive her. They're protective of her, sometimes overly-so, but I think that's in character for the time period Iain and Velloc are both from. I do wish we'd had a chance to get to know more about Iain before Isobel is transported to the past. Even though she wasn't involved with him at the time, we only got a little bit of information on their friendship. Isobel insisted that she only liked him as a friend, so the sudden shift to makeouts was a little jarring. I also feel like we skipped over some of the bonding/get-to-know you time between Isobel and Velloc, especially considering that at first, they don't even share a language. I can see why we didn't get those scenes -- the book is already long, and pages of Isobel-learns-Pict-and-falls-in-love would have gotten old -- but I feel like I could have benefited from a little more relationship building, despite the fact that the whole premise of the book is kind of "fated to be together". Overall, this was an enjoyable read, and although the ending sets things up for more books in the series, the book stands on its own fairly well. There are lots of steamy parts, so this is definitely recommended for older/mature readers. Sound interesting? Enter the giveaway below for a chance to win a copy for yourself! This reminds me of The Outlander series. I can't wait to read this book. Thanks for having the giveaway. Thank you, Rose! Many reviewers have said the same thing. I think it's perhaps a touch of Outlander blended with a bit of Lara Croft Tomb Raider. :) ... I can't wait for you to read it too. I hope you enjoy it. The Outlander thing is what drew me to this one, too! Thanks for reading! Thank you for the great review, Sarah! I'm happy you enjoyed the story! Although I am not much for historical romances, the time traveling aspect of this one is interesting. I like that the MC is a strong, independent woman who doesn't let the man (or rather MEN) in her life control her. All in all, it may be a story that I would enjoy. Have to read it to see! The time travel was a neat aspect -- it takes place part in the present day, with most of the major action happening in the past, but the MC never loses her sass. It was a pretty cool take on the scenario. Hope you enjoy it, if you check it out! Time traveling books make my head spin. This sounds good though. They really can! This one wasn't too overwhelming with the time travel stuff, so it was pretty easy to understand. Thanks for reading! Most definitely! It was a very fun read. Thanks for stopping by!